We already have covered technique in on and off-ice videos and articles for every shot. 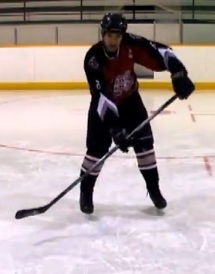 If you need help here’s a link for the slapshot, wristshot, snapshot and backhand. Here are a few questions you should be asking about your technique. Are your hands in the right spot for each shot? Would moving your bottom hand higher or lower increase or decrease your power? Are you transferring enough weight into your shot? Are you using all of your muscles to get power, or just your arms? Can your harness all your power while skating? 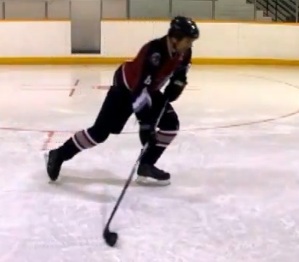 Are you using your stick flex enough in your shot? Many people think their shot is fine, but if you don’t have an absolute answer to every question there is a good chance your shot could use some work. This is the biggest problem I see with most hockey players, especially newer players. They simply aren’t using their legs enough to put more power into their shots. Your legs are the most powerful muscles in your body, yet many hockey players don’t use them when they shoot. Even the ones that do use their legs can likely get more power by using them more! “How do you use your legs to get power in your shot?”, I’m glad you asked. Whenever you are practicing your shot make sure you are bending your knees. With your knees bent you should really push off with your back leg and transfer all that energy to the front leg. Think of it like jumping into the shot, you want to start your shot with an explosive burst of energy which starts from the legs. This is the 2nd biggest problem I see, and it’s not getting enough snap at the end of the shot. This happens with the wrist shot, slapshot and snapshot. A lot of beginner players develop their shot and are using just their bottom hand. A good fluid shot will be using both hands to pull the stick (and puck) towards the net, and end with a final snap (pulling back with the top hand and pushing forwards with the bottom hand). Get your top hand away from your hip and start using it in your shot!